Brrrr. That’s the vibration from my mobile phone. Anne has just texted me. “You should check rue Princesse for today’s pic.” Have I told you just how wonderful my friends are? They are keeping an eye out nowadays for anything that may be of interest to me and send tips my way. She was, however, being mysterious. It means I do need to check this out myself. As soon as I turned into rue Princesse, I couldn’t stop giggling. And silently thanking her for knowing me this well. 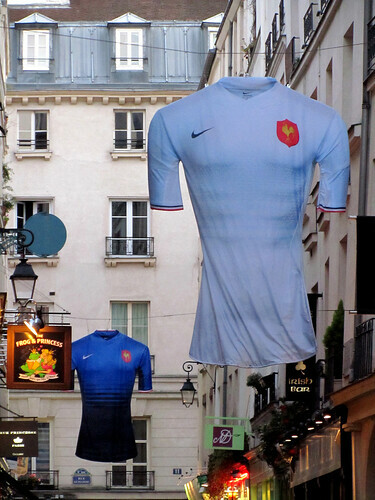 Two French rugby jerseys in gigantic size are hung over the street, reminding everyone that France is still in the game and on path to compete for the Webb Ellis Cup. They would have to defeat Wales tomorrow to be in the final, against either Australia or New Zealand. Nailbiting stuff! Ps: France fell at the last hurdle, losing the Rugby World Cup by 1 point to New Zealand on 23 October.